Seaside strolls, beach days, sandy feet, and the sun’s bright rays are all summed up in this warm and welcoming centerpiece that any ocean lover will adore. 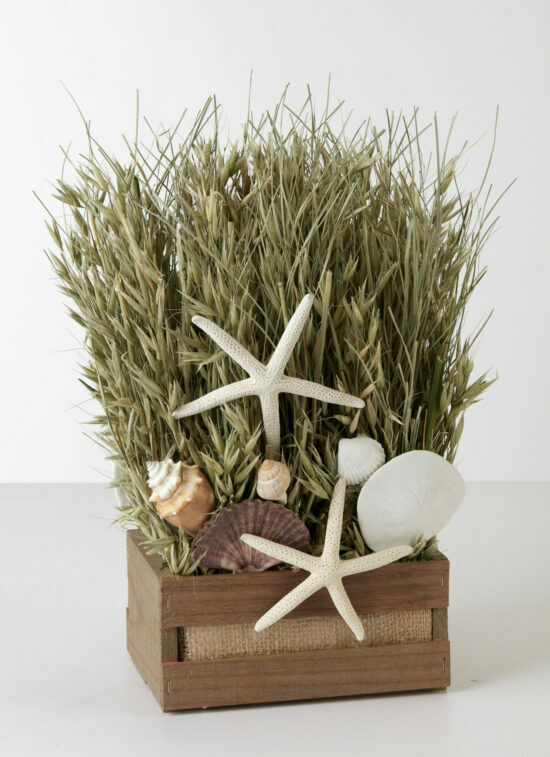 A lush backdrop of preserved beach grass shows off a quaint collection of seashore favorites, including starfish, seashells, and a pristine white sand dollar. To remove, simply snip wires from the bottom of the box and lift the item gently. Our preserved designs are originally produced with extra elements so slight shedding during transit is normal. The colors will soften naturally over time. The designs are best maintained when displayed indoors, away from direct sunlight, strong heat sources, and extreme moisture. To keep a seasonal item from year to year, store it in its original box with tissue and, if you wish mothballs, cedar or a small silica gel packet. Please note: outdoor display is not recommended.